Our worship tradition is called “Anglo-Catholic” or sometimes “high church.” We celebrate the richness and diversity of our heritage with chanting and incense. We use a worship book developed for each liturgical season. Text for the service comes from The Book of Common Prayer 1979 (BCP) and Enriching Our Worship. Music is from The Hymnal 1982 and Lift Every Voice and Sing (LEVAS). Contemporary Worship is usually the last Sunday of every month. We use texts from Enriching Our Worship and other sources. Recordings of Gospel and Praise Music are used. Fridays at noon during Lent we offer Stations of the Cross. Special services are held on Christmas Eve, Ash Wednesday, Maundy Thursday and The Great Vigil of Easter. Officiants lead the portions of the service that are not reserved for clergy. Subdeacons assist the Celebrant in the liturgy. Revised Common Lectionary (RCL). Carole Simon oversees the lectors. Intercessors lead the Prayers of the People during the service, praying for the needs and concerns of the people inside and outside the walls of the church. Carole Simon oversees the intercessors. Chalice Bearers (Lay Eucharistic Ministers) are appointed by the rector to serve the wine at the Eucharist. Lay Eucharistic Visitors are licensed by the diocese to take the bread and wine consecrated at the Eucharist to those whose age or illness prevents them from attending church. Altar Guild members prepare the church for worship, care for the vestments and vessels used in worship, and clean up after the service. The director of the Altar Guild is Juliet Farrell. Acolytes assist the celebrant in worship as boat bearers, crucifers, torchbearers, thurifers and servers. 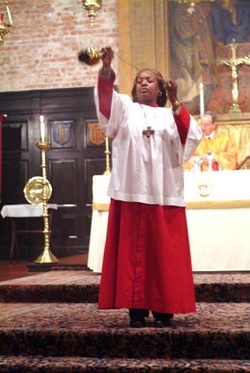 Iva Kirnon currently oversees the work of the acolytes. Ushers greet and assist members of the congregation. If you wish to take communion but are unable to come forward, please let an usher know and communion will be brought to your seat.